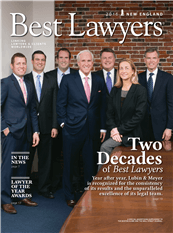 Lubin & Meyer partners were featured on the cover of the 2016 edition of Best Lawyers New England, an annual supplement to the Boston Globe and Wall Street Journal. The publication lists all New England attorneys who have been included in Best Lawyers®, the oldest and most highly-respected peer review guide to the legal profession. The publication's cover article, Two Decades of Best Lawyers, highlights Lubin & Meyer's leadership on patient safety issues, which has earned the firm recgonition nationwide. One example given: Lubin & Meyer lawsuits are at the center of the controversy over the practice of a single surgeon double-booking or overlapping surgeries — used by surgeons at Massachusetts General Hospital and others — which was recently covered in an exposé by the Boston Globe's Spotlight Team. Lubin & Meyer regularly obtains many of the largest medical malpractice and personal injury verdicts in Massachusetts, New Hampshire and Rhode Island. Last year, the firm achieved an unprecedented 50 verdicts and settlements of $1 million dollars or more, as compiled and reported by Massachusetts Lawyers Weekly — including the largest verdict of the year in Massachusetts: $35.4 million on behalf of a woman paralyzed after childbirth.